Kemp, TX: Industrial lighting leader, Larson Electronics LLC, released a massive 7,680-watt, cube mount LED light plant, perfect for stadium lighting, rig lighting, concerts and other outdoor events. This lighting system contains 16, 480-watt LED lamps that emit a total of 960,000 lumens, and features a skid mount designed for elevated illumination. 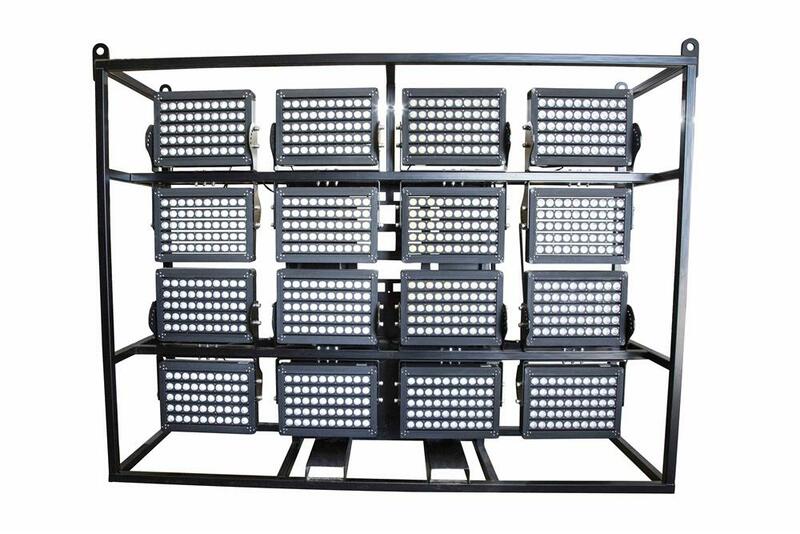 The SMLP-16X500LTL-LED-1227 cube mount LED light plant by Larson Electronics is a colossal lighting system for outdoor events and stadiums, off shore and large-scale industrial sites, as well as emergency camps and construction sites. This 7,680 watt LED system is comprised of 16 LED lamps that each produce 480 watts and a combined 960,000 lumens of cool white light, enough light output to illuminate up to 70 acres and reach distances of 1,000 feet. The LEDs are paired with high purity optics which produce a brilliant flood beam that effectively lights up large spaces. To help focus and amply the illumination, each lamp contains a reflector for even greater output at elevated heights. Designed for seriously rugged use in demanding outdoor environments, the SMLP-16X500LTL-LED-1227 is mounted on a cube-style platform constructed of carbon steel, which features picking eyes for stress-free hoisting and transportation. Forklift skid pockets, locking casters and a top located lifting eyelet are also available, allowing easy lifting with forklifts, cable or chain hooks. This results in a stable, durable and well-protected lighting system that functions well in heavy-duty industrial applications. The unparalleled LED heat control and IP67 protected die cast aluminum housings, means the LEDs in this system can withstand rapid temperature changes and extreme weather. Resistant to water, dust, dirt and humidity, this LED light plant is ideal for rough, dirty and damp working conditions.